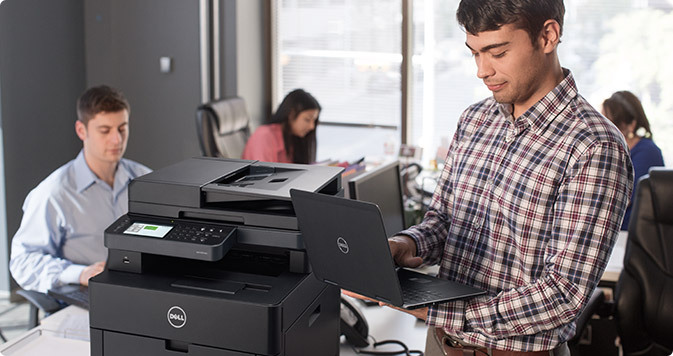 Versatile with direct cloud connectivity Multifunctional and connected: Print, fax, scan, copy and connect to popular cloud services with Dell Document Hub. Simple document conversion: Cloud-based Optical Character Recognition converts content into editable, searchable files at no extra cost. Effortless scanning: Handle large-volume scans easily and with less waiting time using the single-pass, dual head 50-sheet Duplex Automatic Document Feeder. 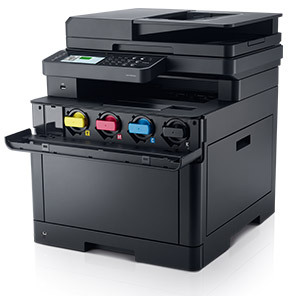 Get more done, fast: Get fast print speeds of up to 25 ppm (letter - simplex; color/black). You'll also save up to 50% on paper with automatic two-sided printing (the default print setting). 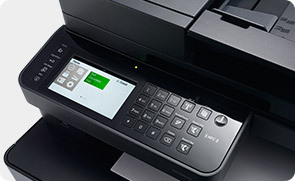 This printer supports printing on recycled, renewable content and chlorine-free paper. Easy installation: Get your printer up and running fast via WiFi with the Dell Printer Easy Installer, the world's simplest printer Wi-Fi installation*. Launch, Click, Ready - it's that easy. Launch tasks quickly: Just tap the icons on the on-screen dock menu or swipe the 4.3" touchscreen for easy activation. And you can launch your last tasks, including associated settings, with one touch of the -Recent-icon. Intelligent scanner: When paper is detected in the ADF or scan bed, the Recent screen will be automatically displayed with up 8 previous ADF or scan related tasks, saving you time and effort. Print on the move: Print directly from compatible mobile devices with the Dell Document Hub app. 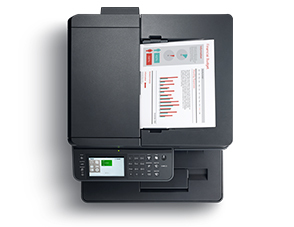 This printer also supports AirPrint, Google Cloud Print and Mopria, so you can print from virtually anywhere*. Effective collaboration: Salesforce connector on Dell Document Hub streamlines processes for mobile sales teams and enables scan-to/print-from various Salesforce folders. Fuss-free set-up: New toner cartridge design prevents spillage during shipping, eliminating the need for sealing tape, so replacement is quick and hassle-free upon delivery. Minimize downtime: Paper jams are easy to access and address so you can get back to work quickly. 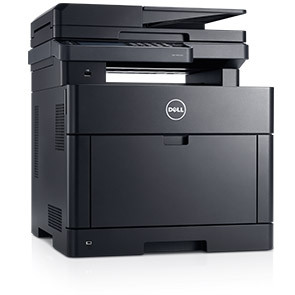 Simple management: Dell Printer Hub software enables easy printer firmware updates, shortcuts and toner alerts. Complete your printer experience with a toner cartridge and an additional 550-sheet paper tray. Look for these great products and more at checkout. Save with high-yield Dell original toner cartridges (3000 page yield black; 2,500 page yield in Cyan, Magenta and Yellow). Improved, low-melt toner is energy efficient and delivers superior print quality. Increase the total paper capacity to 850 sheets by adding this optional 550-sheet lockable input paper tray. Embedded Web Server access control for network port, protocol, printer settings and reports. EN 60950-1/IEC 60950-1; EN 55022 (Class B); EN55024; EN61000-3-2 (Class A); EN 61000-3-3; CE Mark (EU); UL 60950-1 / CAN/CSA-C22.2 No. 60950-1-07; ICES-003 (Canada); US CFR Title 47, FCC Part 2 and 15B, Part 15C and Part 68; FDA/DHHS (21CFR, Chapter 1, Subchapter J; RCM (Australia); Telepermit (New Zealand); Singapore Mark; SABS/ICASA (South Africa); NOM NYCE (Mexico); GS Mark (Germany) and other certifications required by individual country.